The Leader of the Opposition, Dr Keith Rowley, played a significant role in the fall of the previous PNM Administration both because of “his silence and permissiveness in the face of rampant corruption” and “because of his arrogance and refusal to listen and understand the concerns of citizens,” Prime Minister Kamla Persad-Bissessar SC said on Wednesday. The Honourable Prime Minister was responding to remarks made by the Leader of the Opposition to the Port-of-Spain Rotary Club on Tuesday. In a statement issued Wednesday, the Prime Minister said: “The Opposition Leader’s claim that the PNM would have retained power if the UDECOTT and Calder Hart issues had been better managed is an insult to the people of Trinidad & Tobago who survived their tyranny and failure as a Government,” Prime Minister Persad-Bissessar said. Claiming that Dr Rowley has never fully explained his own involvement in the rise of Calder Hart under the previous PNM Government, the Prime Minister pointed to his “silence and permissiveness, sitting in Cabinet for five years after he alleged bid-rigging at UDECOTT” and recalled senior PNM members labelling Dr Rowley as a “self-serving hypocrite”. 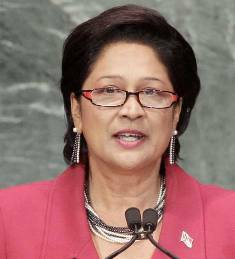 “It is arrogance and denial that still blinds Keith Rowley from seeing how the PNM has sacrificed its own chances of electoral victory by failing to understand its deficiencies, and refusing to modernize,” Prime Minister Persad-Bissessar said. Also remember, it was the same Leader of the Opposition who during the 2010 election campaign, promised a court martial of the then captain of the PNM ship. It was the same Dr Rowley who hounded his former leader from office, so he can be the new captain of the ill fated ship.